Now, comes the hard work. “This is just an opportunity for ten months to talk,” said Pamela Kershaw, the port’s director of commercial real estate. The ENA calls for the ballpark group to deposit $100,000 with the port, half of which can be used to fund various studies on the 50-acre property. The agreement may also shed details on the feasibility of the site for a ballpark and its costs to investors and the public. “A’s fans are really ready to get some answers to these question,” said John Henson, who is part of a fan group seeking a new ballpark for the A’s — Oakland Fan Pledge. At Thursday’s port meeting, local business interests neighboring Howard Terminal asked that they be included in the vetting process as well. A representative for trucking companies at the port raised concerns over the co-mingling of pedestrians and trucks near the proposed ballpark, along with assurances the day-to-day business of the port not be affected. Ghielmetti added that the ballpark group now includes fifteen local businesspeople, including Clorox CEO Don Knauss, former Dreyer’s Ice Cream CEO T. Gary Rogers and former Oakland Planning Commissioner Doug Boxer. 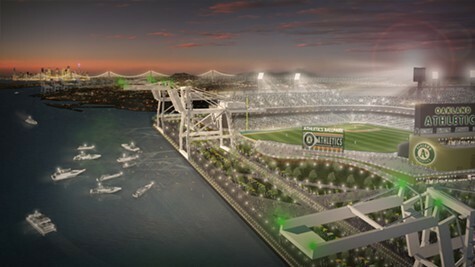 Ghielmetti said the group is committed to keeping Oakland’s sports franchises in town. “We look forward to hopefully putting something positive together and playing ball sometime in the future,” he added.